What to do the first week of being laid off. Cook! I should be updating my blog more often, especially when technically, I should now have a lot more free time. Some big events since last time which can be said in few words. – I have no job. I got laid off last Monday. I wasn’t in denial, the writings were on the wall, I expected it for a while now but for some reason when I was in it, I couldn’t proactively change it. Maybe it’s the food thing. Maybe I needed some downtime to recharge. Maybe – and this may seem very “spoiled” of me to be saying so in midst of a recession and stinky job market, but maybe, I don’t want a job just for the paycheck. Maybe I’d like to have so much fun at work that it won’t feel like working at all. Maybe I’m just a dreamer and there’s no such thing. I gotta think there’s gotta be something bigger and better out there. I will however admit that the older you get, the more fearful you are of going for that dream, fearful of losing it all. 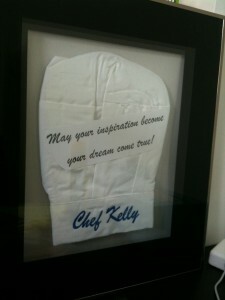 Maybe that’s why the folks at work gave me a chef’s hat shadow box. – I’ve been playing. Week one of being unemployed – there – I said it – has actually been quite busy and fun. Took another Osteria Mozza cooking class – Bolognese sauce – which was simply. Amazing! What high I got playing the “sous chef” side-by-side with executive chef, Matt Molina – stirring sauces, shaping homemade pasta and seeing Carnaroli rice being toasted golden brown and transforming into voluptuous risotto. I felt like a superstar student. Came home at 11pm with a bolognese sauce-infused arm to prove it. Had such an awesome time! – I volunteered to work for free. WHAAAT? A guest speaker to the UCLA extension class on restaurant operations, Brad Metzger, a headhunter to famous chefs mentioned that he may be looking for an assistant/”sous chef” for his newly constructed Test Kitchen – where the various chefs “try out” their tasting menu to those clients who are hiring. I found myself raising my hand up high, volunteering to be not only the assistant/”sous chef” but also cleaning up mounds of dishes. How cool would that be to be helping side-by-side with chefs whipping up their magical creations? After 30 min conversation with Brad, convincing him why I was the ONE – I got the gig! Can’t wait for the first one~! – I’ve been cooking up a storm. It started out with a book, My Bread by Jim Lahey. Words cannot say how beautiful the book is – all about baking artisan bread WITHOUT KNEADING! And this is coming from a non-baker, a baking avoider! 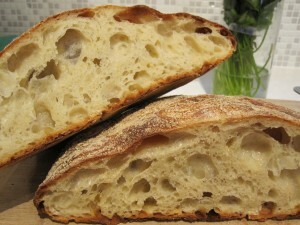 Not only is it easy but it’s just beautiful to watch the process of bread rising slowly on a 1/4 tsp of yeast and the dough softer than marshmallow but then converting into a crusty, brown outside, soft and”toothy” on the inside, singing its crackling song as it comes out of the oven. I’ve been converted into a bread baker. And then, of course, I had to slave over the stove for 6+ hrs making my first bolognese sauce from scratch and serving it over pasta over couple bottles of pinot noir in wonderful company of friends who gave rave reviews on the dishes. I gotta admit it was really good – pure comfort food! Tonight’s dish – Grilled chilean sea bass with roasted tomatoes and served with sauteed brussel sprouts – my new favorite vegetable. 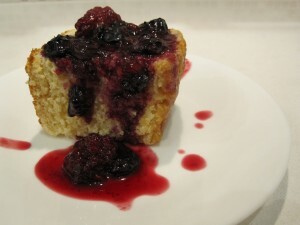 This entry was posted in becoming a chef, Chef Kelly and tagged artisan bread, bolognese sauce, coffee cake, cooking class, jim lahey, kitchenaid, laid off, my bread, osteria mozza. Bookmark the permalink.